The long weekend is winding down. The weather has been October at its best–clear, mild, cloudless sky. Leaf color is approaching peak. It’s that time of year when I drive around, doing errands, going to and from work, in a state of awe. Every year. Without fail. Astonishment at how beautiful it is, especially on a bright day when the light shines through the scarlets and yellows and oranges. The garden is winding down. No frost yet so there are are still some a nnuals blooming–a few dahlias, the nasturtiums, which have taken over the raised bed, the potted up New Guinea impatiens are all still in bloom, although not all very enthusiastically. Asters are starting to go past and the phlox are finally ending after blooming most of the summer. Soon it will be time to cut things back but not quite yet. Tom and Lily cleared out the back bed this summer. They left one small area of perennials–some cat mint, a few transplanted roses, some Japanese anemones. This all surrounds the spot where I buried my cat Sam a few years ago and I didn’t want their digging to exhume him–so, the Sam memorial garden. 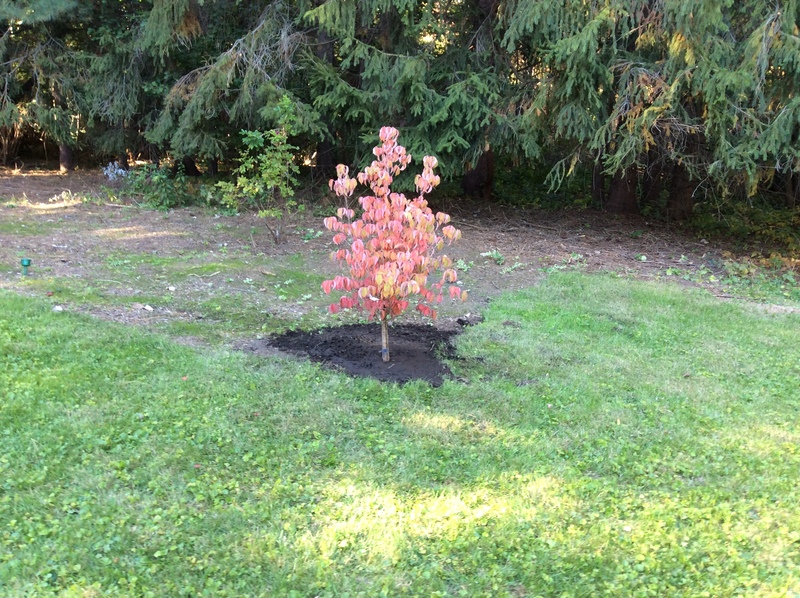 Today, Tom planted a kousa dogwood at the front edge of the dug out bed. I think the white bracts will be stunning against the tall evergreens at the back of the yard. 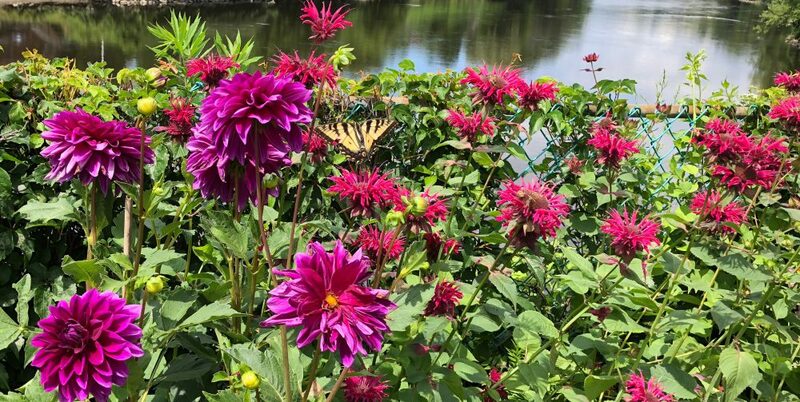 I’ve been thinking about what to plant in the raised bed next year–more zinnias in a range of colors, maybe some marigolds and snapdragons. No cleomes–they dominated all summer until I tore them out–and fewer nasturtiums. And that’s the report from the garden.